Do you want a Spiral staircase or circular? What is the difference? A spiral has all steps coming off a central pole. The handrail is only on the outside and the staircase is narrower then a circular staircase. They are more compact. A circular staircase has an inner and an outer radius with hand rails on each side. A circular Staircase can be made wider and straighter since it does not need to conform to the pole. It takes up more space but the curve can be customized to fit the environment. Both sides of the steps are tide in structurally. Circular stairs are easier to bring furniture up and down compared to spiral stairs. There are special things that we can do to finish off the steps such as carpeting or wood. For outdoor commercial locations we can use gratings to keep the snow from collecting on the surface. We can create gates at the top and or bottom of the stairs. They can be spring loaded. All gates around pools must be spring loaded. Watch out for Spiral Stairs Kits. On a spiral staircase kit, the nuts and bolts could loosen up. They are not as sturdy They usually do not fit as well as a custom project. The landings could be too big or too small. 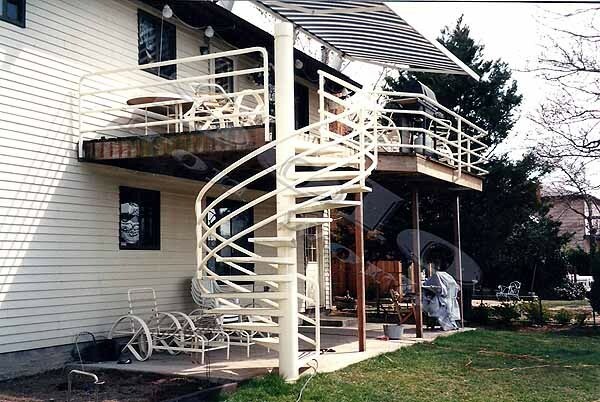 You would have to work around the spiral stairs kit since it is not customized.